If water color trays aren’t your style, there are of course other options. 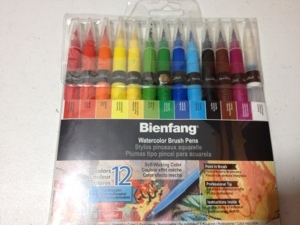 Like the Bienfang watercolor brush pens for example. The pens come in a dozen colors and with a blending pen. The colors are roughly two of the standard assortment: two greens, two yellows, two reds, two blues, an orange, a brown, a black and a purple. They vary in shades enough to make them unique from the standard assortment of bright crayola colors, but they still aren’t the most natural of colors. 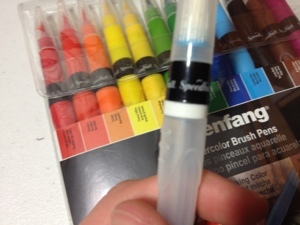 They come with the color separated from the brush like most brush pens. One must remove a ring to expose more thread that the cap can screw into to connect the two. The design is one of the best I’ve seen but leaves no room for more color. Once a pen is used fully there is no option but to discard it. 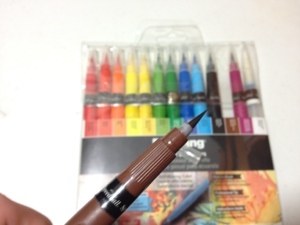 The color must also drain into the brush before use and the body of the pen must be constantly squeezed to keep fresh color in the brush. But this is common on many cheaper brush pens and is no real problem. The brushes themselves are nice and tend to keep a point (once they are full of color). They do have a tendency to have a problem with the cap but that may just be me having a problem putting them back on. The color is applied in nice, smooth strokes if the brush is full and does layer and blend as expected. They are rather muted, though, and are hardly distinguishable from similar colors in the set until multiple coats are applied. Even then it is hard to tell the two reds or yellows apart. The color is also not true water color and is resistant when dry and stains clothes, so one should be careful when using it. If one likes the watercolor esthetic but does not want the hassle of the tubes or trays, I’d say this is a good replacement. It does not, however, have all of the benefits of full water color. It is pleasant looking and nice to use but simply cannot capture the full water color appeal. I personally have found very little use for full water color and only a little more for this. I am not a fan of using either, but if you find that you are in need of a watercolor look, I would recommend a look. This entry was posted in Advanced Supplies, Utensils and tagged art, bienfang, brush, brush pens, color, paint, pens, review, water, water color by Dragon Co (Austin Smith). Bookmark the permalink.